Our church has been doing a series on Christmas carols and really digging into the meaning of the songs and the scriptures they are based off of. These are songs we have been singing since we were little, so it is really neat to delve into them and really dissect the meaning of each one. I found the story of how "O Holy Night" was written to be very interesting, so I thought I would share! 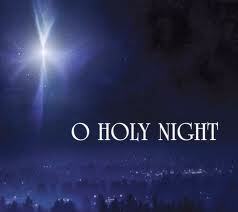 "O Holy Night" was written in the mid 1800s. A Parish priest commissioned a French wine merchant and poet named Placide Cappeau to write a poem from Luke 2. Placide was not a Christian and furthermore was known as a real "hell-raiser". He wrote the poem and loved it so much that he asked his also non-Christian friend to set it to music. The song became widely renowned and began to be played in churches everywhere until people realized who had actually written the song. It was too late though. The song was already mainstream. In Christmas Eve in 1906, a Canadian professor took a make-shift generator, plugged a mic into it, and broadcast the very 1st AM broadcast ever. He quoted Luke 2:1 into the microphone and then took his guitar and played "O Holy Night", the first song ever broadcast across airwaves in the history of the world. How cool is that?! Our Last Weekend Before Christmas in Texas! Tacky Christmas Sweater Party 2012!